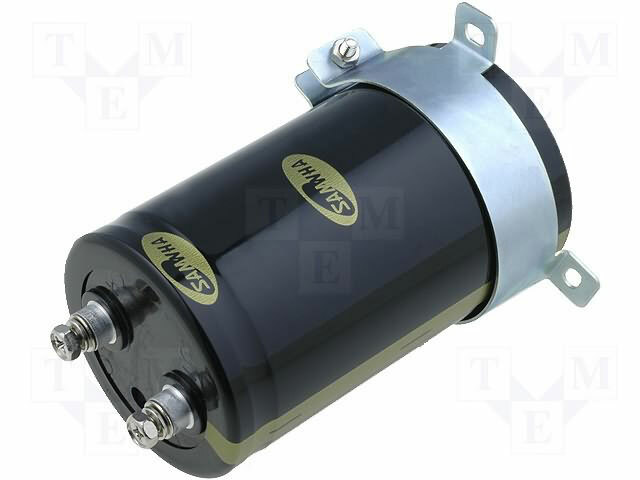 The TME’s range of products has been enriched by GF series SAMWHA electrolytic capacitor. GF2H338M76140SBcapacitor with the capacity of 3300uF is characterized with a long time of faultless operation up to 5 000 of working hours, and high operation voltage of up to 500VDC. The capacitor is made in a cylindrical enclosure, with screw outlets of 76,2x130 [mm]. Assembly to the enclosure is ensured by a steel connection clip attached to a capacitor as a kit.